It seems like I’ve eaten more Thai food since I’ve come to Australia than I ever did growing up in Singapore. Everything from the “imitation” Thai that has barely any resemblance to the real thing, to the truly enjoyable experiences that is as close as I can get this far away from Thailand. Mango, soft shell crab, shallot, coriander, with lime juice and Thai salad dressing. Fried eggplant, sauce garlic, chilli, wok tossed sweet basil with Korn Thai’s signature chilli jam sauce and topped with crispy basil. Stir fried curry paste with green beans, sliced kaffir lime leaves and pork rind. With pineapple, rambutan, cherry tomato and julienned young coconut. I’ve always had an ongoing theory that you can’t go wrong with anything deep fried, and I’m glad to say that I stand CORRECT! *buffs nails on shirt*. And here’s the secret code: if you see anything on the Korn Thai menu that has the word “crispy” in it, you should order it. Trust me. The Crispy Basil Duck, for example, reminded me of Korean Fried Chicken with a sticky salty soy glaze and just the barest peppery hint of spice. Except that it’s in duck form, which is plenty fine in my books. Sweet, but not cloying, this dish is superb as an option to share, and perfect to whet your appetitite. Not a fan of duck? Well they’ve got options in the form of Crispy Eggplant and Pad Prik King Crispy Pork Belly, too! The Crispy Eggplant leans a little more toward the duck in its savoury/sweetness, and the Pad Prik King Crispy Pork Belly really ups the ante in terms of richness and flavour. Either way, it’s full bodied crispy delicious goodness, with top points going to the gooey-on-the-inside eggplant. You’ll want to order a double serve of it if you’re sharing – it’s THAT good. On the lighter side of things, the Soft Shell Crab Mango Salad provides a tart, refreshing note to the meal, using shredded green mangoes to cut through the richness of the *crispy* soft shell crab. (You see the theme here?) A great option for a summer lunch, and a nice alternative to the otherwise more-common papaya salad. As far as the mango (and other Thai) salads I’ve had its definitely not a standout, but it’s still immensely enjoyable and has a great balance of flavours. 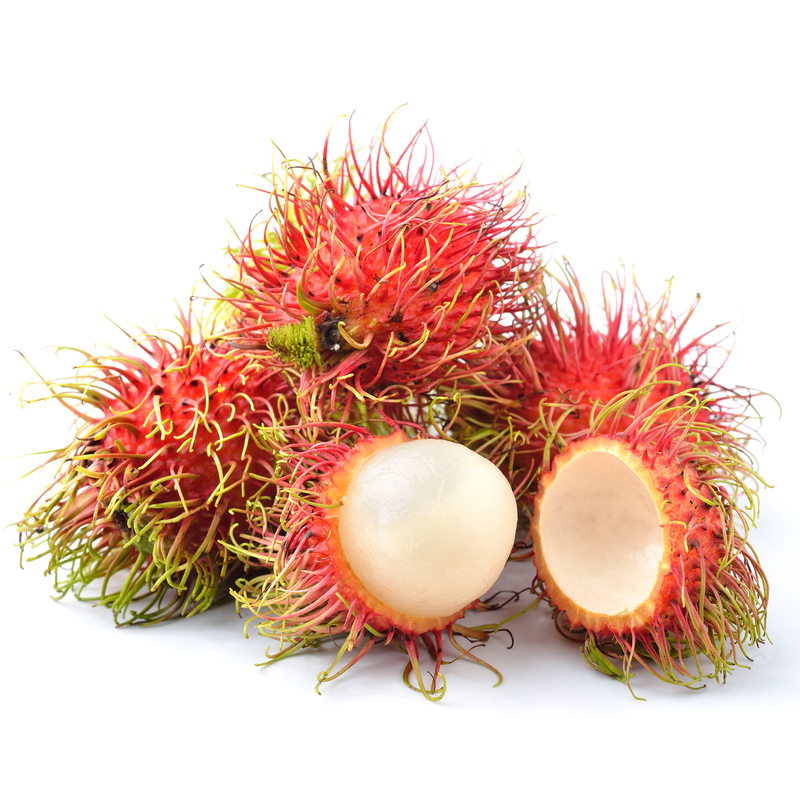 These red hairy looking suckers contain sweet flesh that’s similar to lychees, but just a touch less cloying and much more delicate. It adds a dimension and lightens the curry, and with the pineapple gives it the distinctly Thai balance of sweet, salty, sour and spicy. And if you think that pineapple shouldn’t be in savoury food? The only real downside to the meal was the Deep Fried Ice Cream. The scoops of ice cream – we chose Thai Milk Tea and Pandan – were okay enough, but they were both completely overwhelmed by the thick, bread-like batter that coated the outside. And the syrup over the top didn’t help either: another conflicting flavour is then introduced, further drowning out the already faint echoes of the ice cream underneath. Unfortunate, cause we were REALLY looking forward to it…and also cause it completely kills my *deep fried theory*. Special mention to the drinks though – the whimsically named Ice Pinky Milk brought me right back into humid Asia with the mix of evaporated milk and fragrant rose syrup. So simple, and such a classic. It’s always hard for me to really discuss the service when I’m dining as a guest of the restaurant, but from their interactions with other guests, it definitely seems like they’re plenty friendly, and the staff certainly did NOT have the dreaded “I don’t want to be here” dead look in their eyes. They all seem to know the food intimately, even if there’s some difficulty communicating about the dish in English. One might even say that it added a twisted sense of authenticity to it. But they do try, and it’s this friendliness that makes it easy to forgive them when they forget requests. For example, we had to ask a couple times for a water top up, which the waitress had forgotten because she was tending to another customer’s takeaway order. Ideal? No. But at least she was very apologetic about it, and so lovely that it was hard to hold against her. It’s definitely a very comfortable eating experience at Korn Thai – it’s clean and relatively spacious, with just enough room to navigate between tables to get to wherever you’d need to go. Personally, I’m more the Chat-Thai-so-crowded-you-can’t-get-through sorta atmosphere, but I must say it’s very nice to be able to sit AND not have to tuck in your elbows and bags to keep it out of everyone’s way. Flavour-wise, Korn Thai ticks quite a few of the boxes for me – balanced, punchy, and very moreish. Not quite as hard hitting as some of the cheap-and-quick options elsewhere in Sydney, but a very easy choice if you’re already in the Crows Nest area. I do wish I had more of that eggplant, though.. Looking for places to eat in Crows Nest? Why not read our reviews of Yakitori Yurripi, En Toriciya, Mama’s Buoi, Rice Den, Los Vida and Tall Lemongrass. Insatiable Munchies dined as a sponsored guest of Korn Thai. Sponsored posts are guaranteed reviews which feature honest opinions of the reviewer and their experience, and is not an advertorial.